Rather peculiarly it was at a place devoted to the art of butchery that we tucked in to the best dessert of our recent USA trip. Cochon Butchers, in New Orleans, where award winning Chef Donald Link pays homage to everything that is very tasty in pork, wouldn't look out of place in the darkest depths of trendy Shoreditch. Exposed raw brickwork, iron piping running across the high ceilings and bearded, tattooed waiting staff in a uniform of black skinny jeans creating lethal bourbon cocktails and supervising the pungent meat smoker in the corner . The muffuletta is thought to be the best in the city. It lived up to our tremendous expectations: a warm, fluffy sesame seed roll filled generously with house cured ham, mortadella, salami, Italian provolone cheese topped with olive tapenade, complete with a side of cured pickles. (Yes, it was quite remarkable we still had room for dessert). On the dessert counter, oversized jars of snickledoodle cookies jostled for space with glass stands piled haphazardly with pecan brownies and pretty bowls of parchment wrapped bacon pralines. The refrigerator held a delectable sweet selection: early summer fruit pies, a sticky banoffee pie, an exotic sounding Hummingbird Cake, apple and creole cheesecake and THE Key Lime Pie. 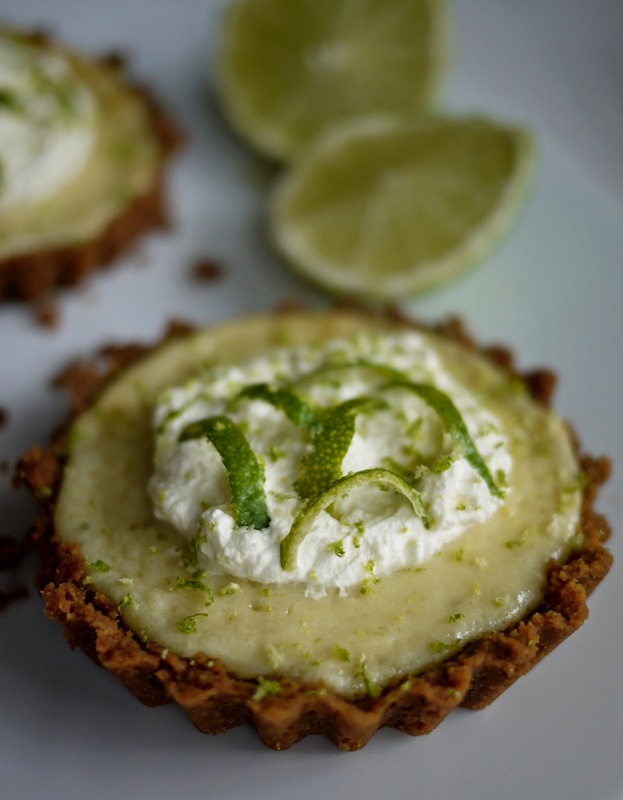 A crunchy biscuit base held a smooth, creamy, perfectly sweetened lime filling. It was one of those jeez-I'm-not-saying-a-word-for-ten-minutes-while-I-demolish-this moments. 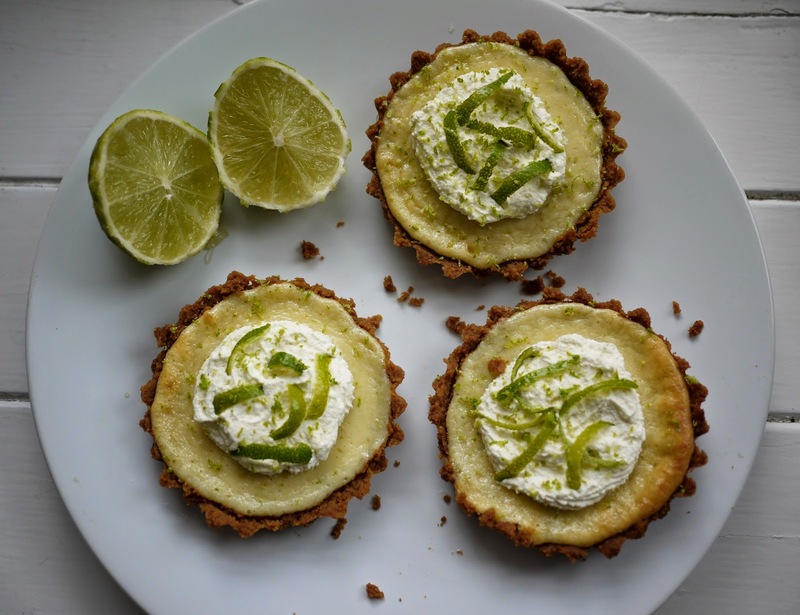 Key Lime Pie uses a very specific lime variety, Key Lime, distinctly tarter and more aromatic than the usual Persian variety. It's very unusual to find these limes outside the state of Florida and standard limes are almost always used instead. Traditionally, the pie is made with a biscuity base and topped with meringue. I've used crushed ginger biscuits to add a warming spice to the base and topped these pies with whipped double cream. 1. Preheat the oven to 160C/140C fan/320F/Gas Mark 3. Crush the biscuits into crumbs by either whizzing together in a food processor or placing in a sealed plastic food bag and bashing with a rolling pin. 2. Melt the butter over a small pan and add the biscuits crumbs. Stir together and spoon into the four individual tart tins. Using either the back of a small spoon or your fingers, press the biscuit mixture into the base and up the sides of the tins. Place on a baking sheet and into the oven for ten minutes to cook. Set aside to cool. 3. Using an electric beater, whisk the egg yolks for one minute, add the condensed milk and beat for a further three minutes. Add the juice and zest of the limes and beat for a final three minutes until the mixture is smooth and creamy. 5. When ready to serve: whip the double cream and pipe into the centre of each pie. 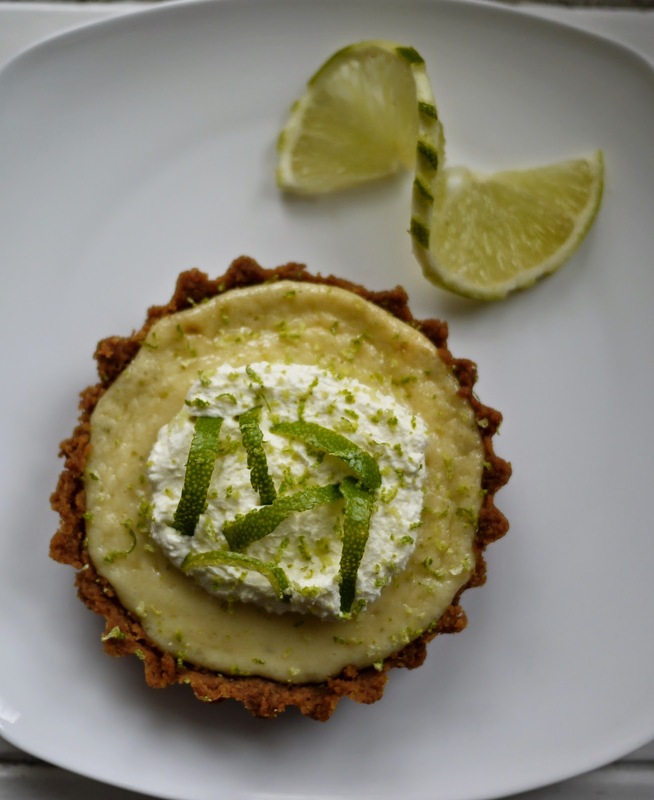 Decorate with the lime zest. 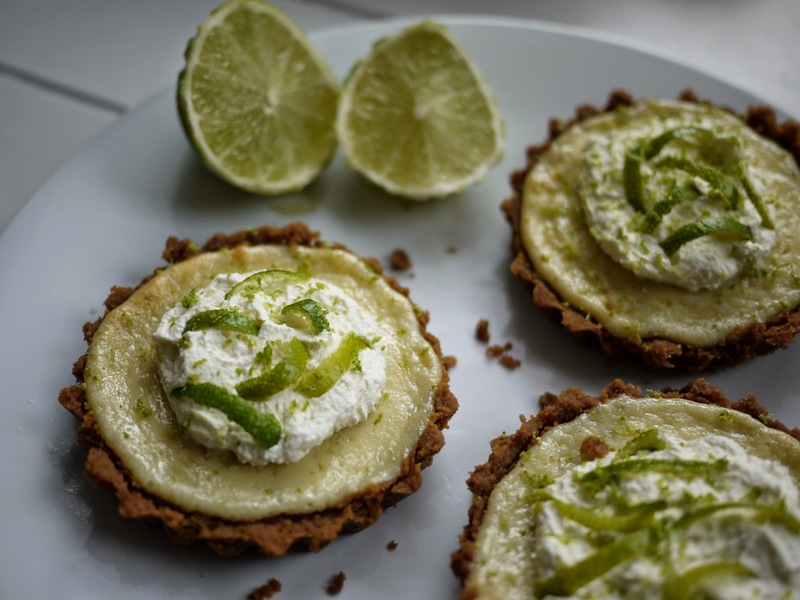 I love key lime pie these individual ones look so cute and tasty. yum! I always love citrus flavours in summer - they're so refreshing. Love your little tarts -so pretty! Absolutely- lemons, limes and the like scream summer to me too!